In the Autumn issue, we are excited to talk about the world first breakthrough in spinal cord research, pioneered by NeuRA scientist Dr Sylvia Gustin; the discovery of spinal cord sensation provides so many people around the world with new hope. Also in the issue, we speak with Senior Principal Research Scientist Prof Karen Anstey on dementia and insights from her research on how to age well. We discuss with Prof Cyndi Shannon Weickert, the NSW Chair for Schizophrenia research, and her team, after their return from an international neuroscience conference held in Washington DC. And chat with Dr Lucette Cysique on how the first generation to grow old with HIV are ageing faster, “HIV is no longer a death sentence it is a chronic disease”. This is all in addition to highlighting our early Parkinson’s detection research and, our collaboration with Bowls NSW to launch the Bowling for Better Balance annuals event. 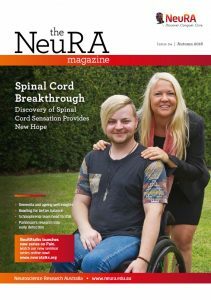 The magazine finishes with a welcome interview with A/Prof Tony Roscioli, a recent addition to NeuRA and a group leader on Neuro-genomics.